Enter what you know about the trapezium and let the tool calculate the rest. This tool makes it easy to calculate sides, angles, height, perimeter and area of a trapezium. A trapezium is a geometric shape that has four sides, two of which are parallel. An isosceles trapezium is a trapezium where the two non-parallel sides have the same length. 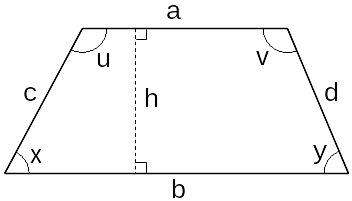 Calculations involving trapeziums can sometimes be done simpler by treating them as rectangles with two right-angled triangles on the sides. The area can be calculated by multiplying the mean of the two parallel sides by the height. Another word for trapezium, that is used mainly in the US and Canada, is trapezoid.